ST. CATHARINES, July 8—Unlikely as it may seem, it may not be that big a stretch to suggest the seed of Nic Pratt’s return to competitive rowing was sewn at a drafting table almost six years ago. 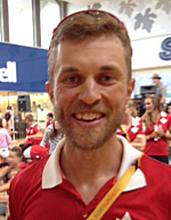 A young man who cut his rowing teeth at Kingston Collegiate, Pratt competed at the world championships in 2008, but shortly afterwards he stepped away from the sport, using his brand new mechanical engineering degree from Queen’s University to get a job with a company that specialized in helping to make buildings environmentally efficient. Pratt knew the quadrennial multisport competition, about to begin this weekend in and around Toronto, includes rowing. Inevitably, perhaps, his thoughts began to drift. “I (thought) it would be cool to work on these projects from an engineering standpoint,” he said, “but it would probably be cooler to be part of the Games as an athlete. On that intellectual screen it was enough of a blip to lead Pratt, when he left that company to pursue a Masters at University of Western Ontario not long afterwards, to seek out the rowing team there, and resume training. “I kind of gradually ramped back up,” said Pratt, who will be part of Canada’s men’s lightweight four crew when the Games regatta begins Saturday. “I’d always had the national team level in the back of my mind as a goal. By then, Pratt had been racing domestically for about two years, and doing not too badly. “There were a few chances during the year, notably the national championships in the fall, where you have an opportunity to test yourself against guys on the national team,” he said. “That gave me an opportunity to get sense of what level I was at. Having not competed internationally since 2008—the lightweight eight-oared crew of which he was a part was sixth at the world championships—Pratt was sixth in the lightweight single at a World Cup regatta in Lucerne, Switzerland in 2013 and last year, in the lightweight men’s double, he was 15th at the world championships in Amsterdam. Back in a sweep boat this year, and doing a little consulting work on the side—“ just to make sure I have a little bit of balance in my life”—Pratt is eager to get the Games racing underway, finally bringing to fruition the notion that struck him that day many years ago when that Pan Am Games facility drawing landed in his In basket. Indeed, the last major international competition to be held in Canada was on the Royal Canadian Henley course in St. Catharines—16 years ago. “It’s pretty special,” Pratt said of the prospect. “It’s really nice to be able to share the experience with friends and family, everybody who’s a part of your career, who’s been involved in supporting you, one way or another. “Everybody is aware of the amount of work you’re putting in, and think, ‘Yeah, you’re training,’ but they never get to see the tangible result, or experience the sport that you’ve worked toward. It’s very intangible. You can’t finish the picture. Racing in the lightweight four begins Saturday, with heats at 9:05 a.m. and a repechage at 2:05 p.m. The final is scheduled for Wednesday, at 9:25 a.m.